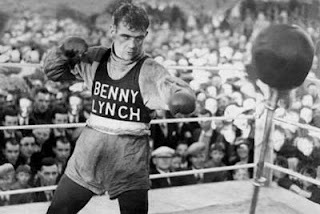 You wouldn't know it as there has been little fanfare over it, but 2013 is the 100th anniversary of the birth of Benny Lynch, Scotland's first world boxing champion. 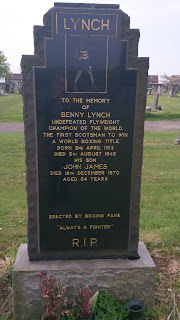 The archetypal Glasgow "wee man" boxer he had no peer in his time, or since it could be argued. Measuring 5 foot 5 and a half inches and weighing in at 8 stone (or 112 pounds/ 52 kg) in his prime, he is arguably Scotland's greatest ever sporting champion. I decided to come up with a wee running route for myself to follow his story and ended up with a 21km/ 13.5 mile circuit starting at the Kelvin Hall (summarised at the end). Benny Lynch was born in the Gorbals, Glasgow on April 2, 1913 in a tenement flat at 17 Florence Street. His parents were from Donegal and Benny was their second son. His older brother, James, died from a head injury he received when working in Babcock's in Renfrew. The Gorbals was the most overcrowded part of an overcrowded city and waves of immigrants had made it the most cosmopolitan area of the city too. First the Highlanders and Lowland Scots arrived as they were cleared from the countryside by the landowners. Later they were joined by waves of Irish, Italian, Jewish, Polish and Lithuanian migrants. 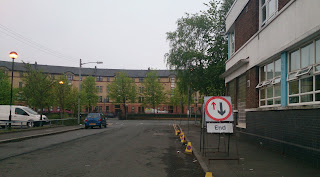 My great-grandparents lived in Gorbals Street until they died in the 1960s and that was when my grandparents and my mother moved out of the Gorbals, as the new wave of clearances moved people away to the new "schemes". In 1920 there were 50,000 people living in the Gorbals, a wedge of land with three borders about a mile long and the former site of a leper colony. They were being served by 1000 shops and 130 pubs. It had been the place where Thomas Lipton came from (Crown Street) and Allan Pinkerton (Muirhead Street) came from but for most people opportunities were limited, particularly in the midst of a depression in the 1920s. It was also the place where John MacLean stood as a Communist candidate in the general election. He died in 1923 when Benny was 10 years old. The Gorbals was largely flattened in the 1960s with the tenements now all gone. Florence Street today, no. 17 must have stood in the car park of the Adelphi Centre on the left, with no.85 beyond the new flats ahead. The last flat that my great-grandparents stayed in is one of the few old tenements that still stands. They lived in the first floor flat here, above what was then the British Linen Bank. If Glasgow City Council don't get their act together it is clear that this building will be going the way of all the rest in the area. Look out soon for a mysterious fire or a declaration of the building being too unsafe to leave standing. My great-grandfather, Peter Donnelly, spent his working life as a dentist at Gorbals Cross, despite having no official dental qualifications, which was often the case in those days. I was reliably informed by my granny that as well as John MacLean holding meetings in his Gorbals Cross surgery, he also made gum shields for Benny Lynch. Whenever I have investigated her stories I have found them to be true, and it seems highly likely that he was making Benny's gum shields as it was in the early 1930s that custom made gum guards were first in common use by boxers. Benny's older brother had been a keen boxer. Benny had a rough early life, getting slashed in the face by a gang as a youth and he was once fined 10 shillings in court for street fighting. As a schoolboy he started boxing and was spotted by Sammy Wilson who became his manager. 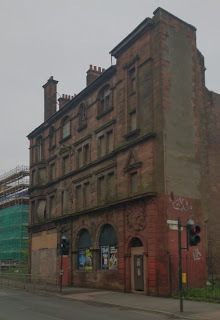 85 Florence Street was where Sammy Wilson, one of the many Gorbals bookies of the day, had his pitch. The 'Squiggley Bridge' leads to Clyde Place. Sammy set up his own boxing club a few hundred yards around the corner at 49 Clyde Place, the New Polytechnic Club, or "The Polly". This street just south of the 'Squiggley Bridge' is largely gap sites now awaiting redevelopment and no sign of The Polly remains. The depression meant that the chance to earn a few pounds boxing at the various "booths" around Glasgow, Falkirk and Edinburgh in all the touring fairs was appealing. Sammy had him running up and down the nearby Cathkin Braes to train, and soaking his hands daily in the brine water of the nearby fishmongers of Stockwell Street to toughen up the skin. He started him in the "booths", such as McOnie's Ring in the Gallowgate where the prize money was £1 and 5 shillings for a six rounder, top of the bill fighters shared a £7 prize. The average weekly wage at the time was £2 and 10 shillings, if you could find work. By the time that he was 19 years old he had fought 30 official professional fights and about the same number of unofficial booth fights. His chance to move up a level came in 1934 when he was on the under card at the first ever boxing bout at the Kelvin Hall, in the west end of Glasgow. Although it wasn't a title fight the 10,000 crowd saw the local man beat Carlo Cavagnoli, the European Flyweight champion. 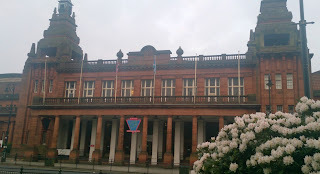 It was the start of a long association of the Kelvin Hall with boxing. 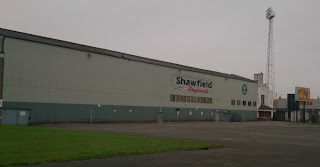 This hall was later to host title fights of many other Glasgow wee men who became world champions, such as Ken Buchanan and Jim Watt. 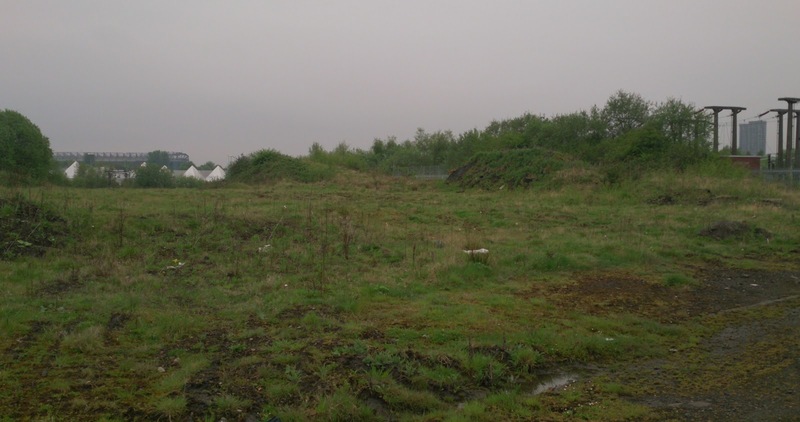 Eight weeks later he won the Scottish Flyweight title, beating Jim Campbell on points after 15 rounds at the "Olympic Sports Stadium" in Parkhead, more commonly known locally as the Nelson Lea whippet race track which stood just north of Celtic Park. 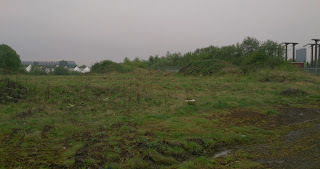 Nothing remains of this here, just a piece of waste ground between the train tracks and an electricity sub-station. A more decisive victory came at the rematch only 6 weeks later (by which time he had also fought and won two other fights). 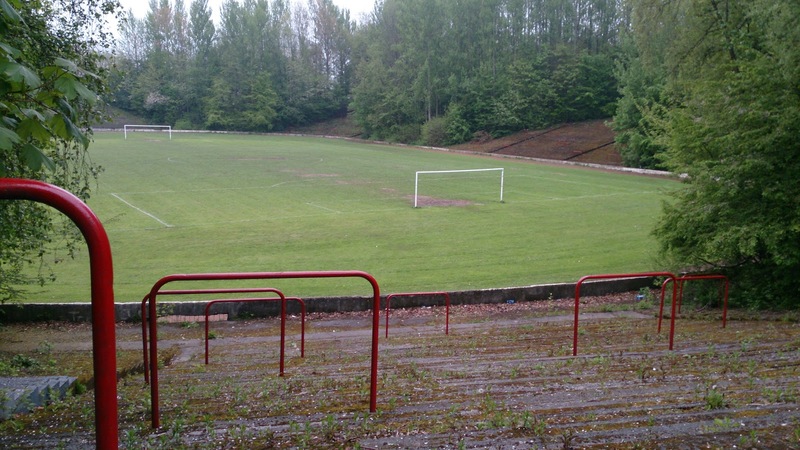 This was held at Cathkin Park, then home of the now defunct Third Lanark Football Club. He won again in 15 rounds, in front of a crowd of 16,000 people. In the last 3 months of 1934 he fought a further 6 fights, including one against Pedrito Ruiz, champion of Spain, at City Halls, currently home of the BBC Scottish Symphony Orchestra. He was now set for a non-title fight against reigning world champion, Jackie Brown in Manchester. The story is that his manager told him to ease back so that Jackie would agree to a title fight and the match was declared a draw after 12 rounds. The plan worked. Six months later they met again in Manchester, in September 1935, and Benny Lynch became Scotland's first world boxing champion. Jackie Brown could not continue in a bout that lasted only 4 minutes and 42 seconds after being knocked down 8 times. It was a ferocious bit of boxing and you can watch it here. 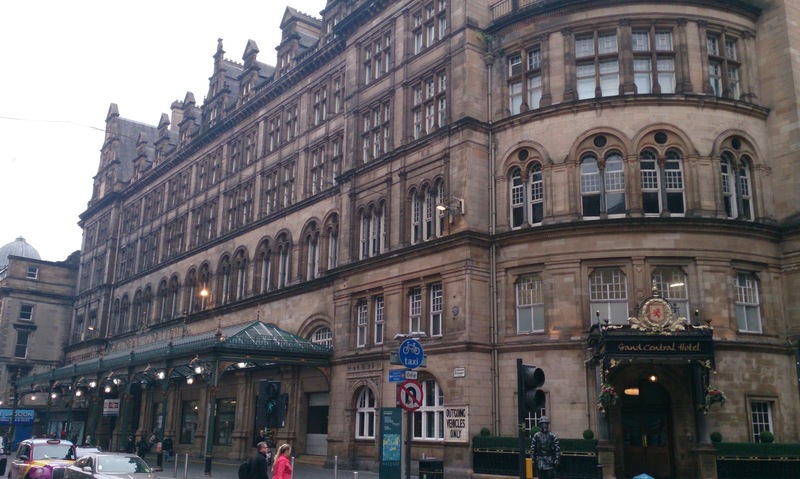 There are three tales you hear recounted of crowds of Glaswegians greeting people off the train on their arrival in the city. The Socialist John MacLean arriving back in the city after release from prison, Laurel and Hardie in 1932 and Benny Lynch, the newly crowned World Flyweight Champion. 20,000 people greeted Scotland's first boxing champion on his return at Central Station, although Glasgow City Council didn't feel his feat merited an official reception. By 1936 his personal life was more troubled with plenty of people helping him to spend his money, his marriage struggling and he fell victim to the traditional Scottish vice of alcohol. He was back together with his wife for a while living in a flat on Rutherglen Road in the Gorbals, above Kings the Tailor. They then moved to a house on Gloucester Avenue, Burnside which he called Belle Vue, after the venue of his title win in Manchester. Struggling to make the weight for fights now he managed to beat American based Philipino boxer Small Montana in 1936 at Wembley, London in 15 rounds to silence the authorities in America who claimed this man as the world champion. 40,000 people came to the then home of Clyde Football Club, Shawfield Stadium, to see him defend his title against Peter Kane in what is often cited as his greatest victory. However alcohol was making him increasingly ill and at his next defence he forfeited his title in 1938 when he was unable to make the weight for the fight with Jackie Jurich. The fight still went ahead and he won, though lost the title. He was 26 years old. In his 104th listed fight he was knocked out for the first time in his career, August 1939, by Aurel Toma in London. His boxing licence was withheld as he could now no longer pass the boxing board's fitness tests. For cash he went back to boxing in the booths for a while, but despite trying to dry himself out by staying with the monks for a time at Mount Melleray Monastery near Waterford his health was failing. In 1946, aged 33 years, he died in the Southern General Hospital and was buried at St Kentigern's Cemetery in Lambhill. Funnily enough this is the same cemetery where my great-grandfather was buried 16 years later. 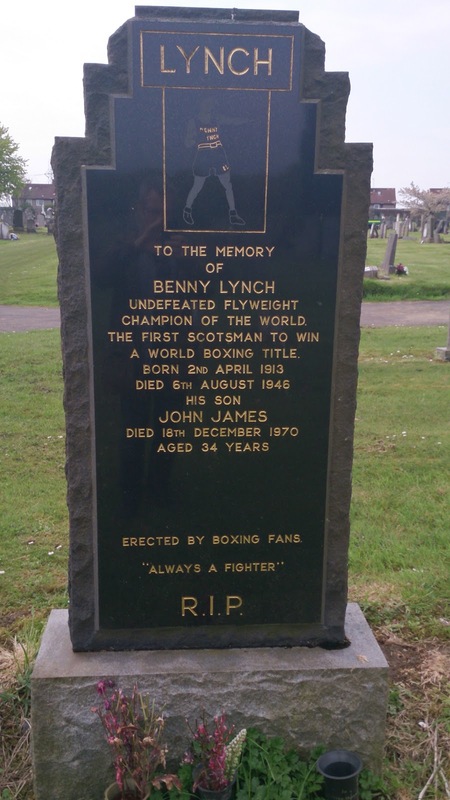 Benny Lynch's gravestone has been restored to mark his achievements, and although Lambhill Cemetery is not the most evocative graveyard in the world, it is worth making the effort to go and see his final resting place. For a running route to visit some of these places I started at the Kelvin Hall on Dumbarton Road and then headed down towards the Clyde and ran along the riverside until I came to the "Squiggley Bridge" after about 4km. Crossing here to Clyde Place where The Polly gym used to be, then along the south bank of the Clyde past the Sheriff Court and around the Central Mosque to come to Florence Street. I then turned back and past the Citizen's Theatre and the tenement photographed above. From there I headed south over the M74 and up Aikenhead Road towards Hampden. After about 8km Cathkin Park is off to the right, a sad and bucolic sight. To extend the route by 6 miles you can head along Curtis Drive towards Burnside to see where he lived once he had some money in his hand, a remarkably mundane street. Alternatively head down Polmadie Road, to Rutherglen Road, where he also lived, before coming to Shawfield Stadium at about 11km. Head across the Clyde and around the left hand side of Celtic Park and around the Forge Shopping Centre onto Duke Street. A quick right turn takes you to the end of the closed off Myreside Street to the wasteland where he won his first British title. I then headed along Duke Street towards the City Halls in the Merchant City and then back through town to Central Station. 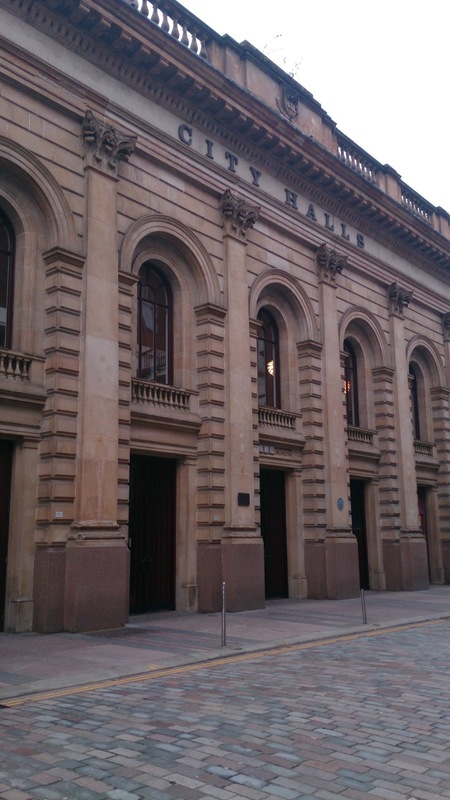 Then up St. Vincent Street back to the Kelvin Hall after 21 km. For map see mapmyrun website. I must include these useful tips to my dental practice.